The Bentway is Toronto's answer to NYC's High Line. 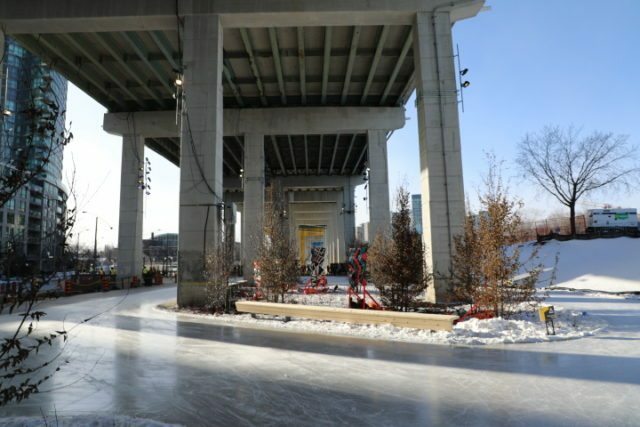 The Bentway, an expansive new public space under the Gardiner Expressway, officially opens tomorrow morning, with a celebratory skate along a 220-metre, figure-eight shaped loop. The opening represents the first stages in a total makeover of the neglected, 1.75-kilometre stretch under the western portion of the raised expressway, between Strachan and Spadina avenues. The area will become “a great multi-purpose civic living room,” and includes pedestrian and cycling paths that will connect a community of approximately 70,000 condo dwellers across Liberty Village, Wellington Place, Bathurst Quay, and City Place to the rest of the city. The Bentway is named after the “bents,” the 50-foot high concrete beams that support the expressway above. The 18-metre long space between the bents are styled as flexible use “rooms,” each with their own theme, art installations, programming, and landscape designs. The Bentway will connect up with pedestrian and cycle bridges to Fort York that touch down on an currently inaccessible triangle of land between rail lines. From there, another bridge will connect to Stanley Park to the north. The Bentway project was initially made possible by a $25-million donation from philanthropists Judy and Wilmot Matthews. Maintenance and programming is budgeted between $3.5 to $4.5 million per year funded through a mix of cash from the city, philanthropists, and corporate sponsorships. The City of Toronto kicked in an additional $500,000 in December to move the project along. 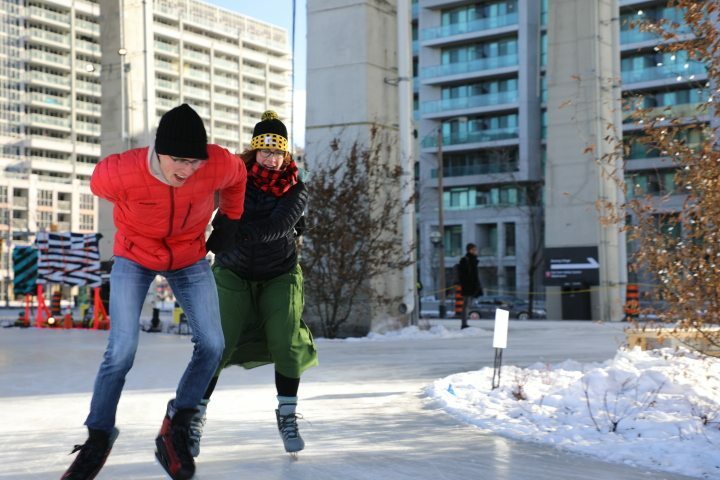 On Friday afternoon, a few Torontonians braved the cold and went for the first skate. “This is the first time I’ve tried doing an axle jump in 10 years and I’ll probably fall,” says Jennifer Geddeos. “This is a nice thing for Toronto, and there’s sometimes a lack of nice things in Toronto,” says Clint Langevin (left). 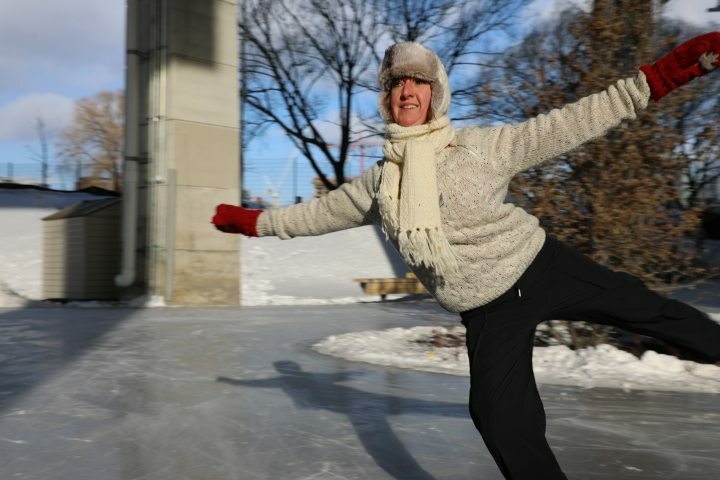 “It feels like a cathedral here under the expressway, and because you are skating, it doesn’t matter that it’s minus-20 out,” says Amy Norris (right). “We live just up the block so this is very convenient,” says Gerald Alvoet (left). 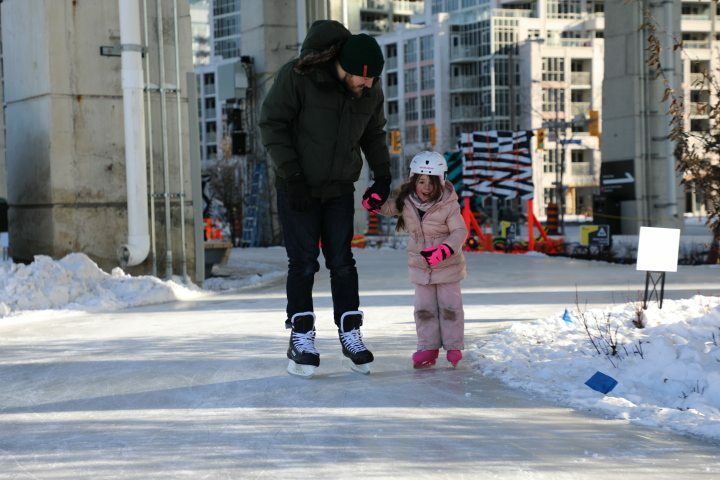 “I like skating with my daddy,” says Sienna Alvoet (right). “This is allowing us to socialize more as a neighbourhood than we have in the past,” says Amy Myhal (left), pictured with Ryan Myhal (right). “We’ve been building a deck today and it’s been crazy cold, but we’re getting the job done as soon as possible to meet the deadline, but sometimes we take dance breaks,” says Duc Tran (far right), pictured with Paul Subryan (left), and Rick Lourensgen (centre). CORRECTION: The original version of this article misstated Ken Greenberg’s employer. He is with the firm Greenberg Consultants Inc., not Public Work.